My latest, and second mix featuring lots of new beats from my studio as well as music from Phatplayaz and Penny Giles - enjoy! 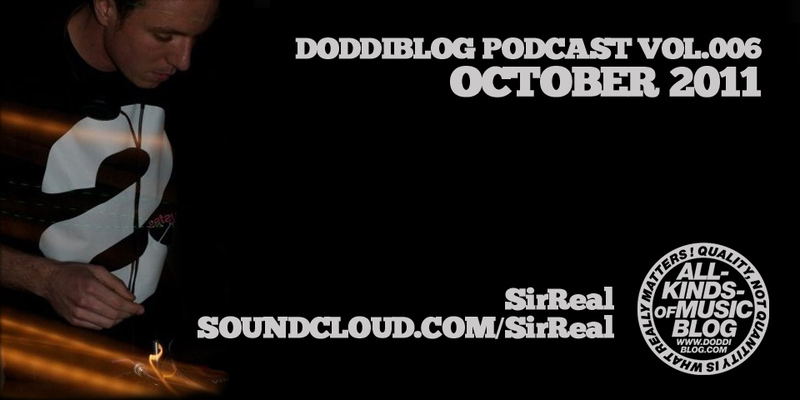 It's more than five months from the last doddiblog podcast episode but it was worth the wait. The name of the man behind the decks and the new episode is SirReal! It's not a unknown name for those of you who follow my blog for a longer period. The mix is full of soulful liquid funk vibes. SirReal also helps to organize dnb parties in London so if you live in the South London’s area (Brixton) and you don't know where to go partying on 9th of December, visit InnerSoul Launch party with Bryan G, Mr Joseph, Jordan V, LSB... For more info about SiReal please visit his soundcloud or facebook page. And enjoy the mix! Truly amazing eclectic mix. Love it from start to finish. Lot of downtempo, house and dnb classics in one mix. Enjoy! Tracklist N/A at the moment. Do you like Tiger & Woods? Did you enjoy their RA podcast & Beats In Space mixes? Then you're lucky, guys released their edits included in both mixes. Great job T&W! During Tiger & Woods recent visit to San Francisco they asked if we'd host and help share these edits, free for download. Many of these edits were first heard on the previous T&W podcasts released on Beats in Space and Resident Advisor. Dixon (Innervisions, Berlin, DE) - same mix as "Dixon live at Robert Johnson Volume 8"
00.22.50 - Todd Terje - Inspector Norse ?? New? 01.05.00 - Carol Hahn - "Do Your Best"
01.43.00 - Jackson Five cover? 01.46.00 - Brassroots - Toto Africa Cover? Tracklist speaks for itself really. 3 of the best artists in dnb. Just over 2 hours of some serious music. This mix is all about the Underdogs, all the guys, new and old, that never seem to get their fair share of the limelight. There are a lot of really great musicians in this position, so these are just a choice few that really hit the mark for me over the past few months. Big Ups to all the underdogs… remember their names; Someone big will be nabbing their music for major releases in the future! DJ set for Fizz Factory Podcast. Podcast 31 has just touched down & Lenzman & Riya are taking care of business this time around. Taking us on a soulful trip through the Metalheadz sound, this is one not-to-miss! Short, 27 minutes long, liquid funk mini mix. It's time for some liquid funk. Smooth, uplifting, jazzy, feel-good Drum & Bass. It has always been my comfort zone. Deep house mix from golden era of deep house. Recloose, Blaze, Needs, The Timewriter... Enjoy! A mix of some spaced out vibes I'm currently enjoying. Svek is definitely one of the greatest deep house label with tons of amazing music. Unfortunately they are not releasing new stuff anymore. What a pity! An exclusive mix from DJ Marky for DJ Mag, chock full of dubplates, classics and forthcoming tracks. Buzzin Fly Podcast to promo the B Side Ep on No.19. Furney - A Long Time Ago - ? Dynamic - 5AM - ? soultec & mSdoS - Believe In Me - ? PennyGiles - Leyla's Last string = ? Makoto is definitely the most musical dnb producer on the earth. Don't forget to buy his new LP "Souled Out" on your favourite digital store on monday (in Japan it's already out)! Thank you Mr. Sorted for the excellent selection and the mix! For Volume 3 in my Atmospheric Session Mix series, I bring you a 68 minute look into some of my favorite tracks from Japanese producer Makoto. This is a jazzy, funky, and sometimes deep look into one of the most musical drum and bass producers of all time. This one is pure vibes folks. (mixed using 2x1200's and SSL). Yours truely selecting from the hip with a nod to the past. Organic beats somewhere between jazzy rollers, dubby bits and good old blodclart jungle techno. Hope you enjoy! Includes also a short interview.